The Archive volunteers have gotten their hands on some pretty great materials: helping to preserve a wide range of motorsports materials and making them accessible to all for present and future generations. Glenn, a motorcycle enthusiast and weekly archive volunteer, has started to unpack a donation from a past Harley-Davidson store manager which promises to have a few hidden treasures and surprising finds. When doing a "first look" survey, Glenn also began to take a first look at a nearby micro-collection soon to be started by a fellow archive volunteer — boxes of VHS recordings of races broadcast on TV, including quite a number of Formula and CART races through the '90s and '00s. 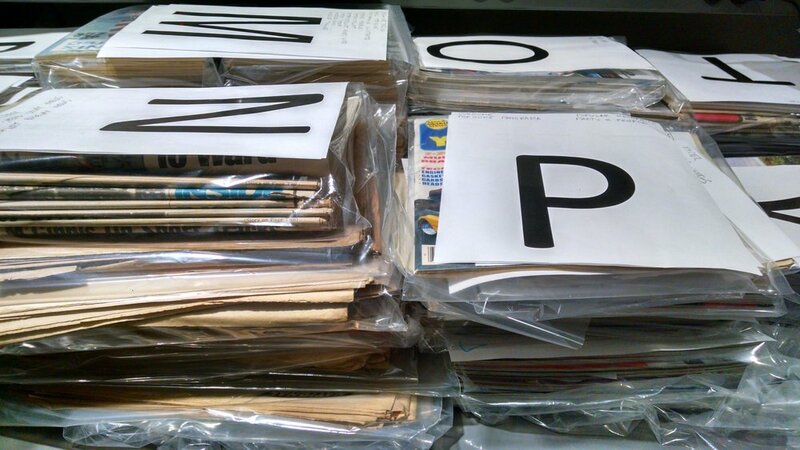 The Archive's processing room is full of volunteer archive projects, including longtime archive volunteer Steve taking on the papers of local Indy car designer Rolla Vollstedt, including his stack of daily journals. Right behind/beside him, Gregg and Frank, having closed up their part in inventorying the Granatelli technical drawings, are now inventorying boxes of an unexpected donation of National Dragster to top off our annual magazine-sorting project. Tom J. has taken on the necessary next step of incorporating new magazine issues and titles into our master magazine list after the annual volunteer sorting project. Taking over both museum classrooms while students were on spring break, our Archive volunteers sprung into action, sorting hundreds of car and motorsports magazines as well as media brochures and press kits for teams, sponsors, race series, and car makers, now available via our research packages. In just over a week, the volunteers gave over 40 hours to organize over 50 new magazines titles and additions to another 45 titles, as well as media guides, press kits, brochures, and other collateral covering another 70 teams, 25 race series, and 50 car makers. New projects continue to develop. Having finished up the Plotts collection of hundreds of thousands of slides, Au has moved to the prints collection of Seattle International Raceway track photographer Jeff Dykes, covering nearly 20 years of racing from the '80s to '00s. If you're interested in volunteering in the archive, contact katrina@worldofspeed.org or visit http://www.worldofspeed.org/volunteer. Newer PostThe Bob Plotts Collection - Lots of Slides!